Even though I am only 31 years old my back bothers me a lot most of the time. I am in good shape, I am not overweight and I get a lot of exercise in my job which is not otherwise stressful, and I run and work out a lot. I have never had an injury to the lower back. 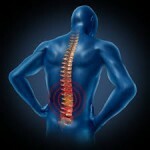 What I want to know is what causes low back pain when someone has never been injured in that area of the body? I know you could not give me a specific answer about my particular low back pain cause, but can you give me a rough idea of the possible low back pain causes? My Mom has a lot of back problems and I do not want to live with that kind of pain. I will do anything to keep from getting a bad back like she has. Low back pain is certainly one of the most common ailments known to man, with 80% of the adult population that will lose three or more days from work every five years because of significant back pain. There are many causes of back pain; so much that It is no wonder it is such a prevalent complaint. Before I get into back pain causes with you, bear in mind that from my experience few health problems have one simple cause; most are usually the result of two or more interacting causes that feed off each other and contribute to make the problem greater than the sum of the parts. To say it another way, one cause of lower back pain makes another cause for more back pain easier to get started. Based on what you have mentioned in your brief email I suspect this could be case with you and the reason the cause of back pain you mention might not easily be determined. Generally, in most cases there are multiple causes of low back pain at work affecting the body; some contributing early and others coming along later, only able to affect the low back because it was weakened by earlier events and problems. Some of these include childhood muscle sprains or pulls, chronic muscle spasms that cause low back pain, and later in life herniated discs, degenerated discs, degenerated joints, ligament laxity and arthritis. For example, herniated low back discs can result from small and easily overlooked missteps or twists; a person does not have to be hit by a truck or try to lift an elephant to cause disc herniation. A herniation of a disc can happened as a result of a sneeze, and not cause any immediate pain at all. Even so, this kind of problem can weaken a back and begin a process of slow degeneration that takes years to advance to the point it starts to create pain. By this time there is enough soft tissue change that low grade inflammation and nerve compression can cause significant low back pain. By far, the most common cause of low back pain is simple muscle tension that often leads to constant spasm and irritability of the low back. When this happens the low back can be in a state of almost constant pain with very little direct provocation or trauma. This common form of back pain is generally started when the low back is stressed and fatigued by repeatedly overworking the postural muscles of the low back. The reason this problem is so common is that most people are not fully aware of the poor posture this kind of back pain can cause since it begins slowly and gradually over many years. Even though you are still a young person, you are old enough that your back pain could be due to early arthritis. You mention that you run and work out a lot. This could easily represent stress and strain to your low back great enough to cause the low back pain you mention. Running on concrete, lifting weights, playing basketball, can all be extremely abusive to the low back especially when done repeatedly over many years. While in your mind you might have not ever had a low back injury, the fact could be that you could have sustained a multitude of small repeated injuries without much awareness at the time. You also mention that your mother has a history of a bad low back. This opens up a whole new discussion. It is always a possibility that you inherited some spinal malformation or soft tissue weakness from her; it is possible that you two share some mechanical flaw in the low back that makes it easier for you two to have low back pain. Of course, all of the above is purely speculation based on the short email you sent, and could be entirely wrong. But then again I have seen thousands of men like you with a very similar story of slowly advancing back pain that seems to have come out of nowhere. From my experience it is very common for guys like you to totally underestimate how abusive you have been to your skeletal structure over the love of sports and being in good shape, as well for one generation to pass on a spinal weakness to the next generation. I am sure you will still love your mom, but she could be the guilty culprit to explain a lot of your back pain. Any discussion of back pain causes should mention fractures, acquired spinal stenosis (a narrowing of the space around the nerves), inflammatory diseases, infections of various tissue in the low back, and in very rare situations cancer. Not at all likely, but you need to keep all possible causes of back pain in mind. You mentioned nothing about it, but is also important to understand that depression, anxiety, work stress, depression or other psychological distresses can aggravate the low back symptoms. I suggest you get the name of a good sports doctor from the folks at the gym where you hang out and get your problem evaluated so you know what you are up against. Ignorance is not bliss. It is better to know the nature of your problem so you can take control of your situation and keep yourself in the best shape possible for the long haul. Now that you know a bit more about what causes low back pain you should be able to avoid it better than your mom did.